Professor Heather Glen has many notable academic achievements to her name: she is the author of Vision and Disenchantment: Blake’s Songs and Wordsworth’s Lyrical Ballads and Charlotte Brontë: the Imagination in History, and an editor of Wuthering Heights, The Professor and Charlotte Brontë’s last five Angrian novelettes. She is currently completing a book on Wordsworth and the discovery of ‘the people’ in the 1790s. 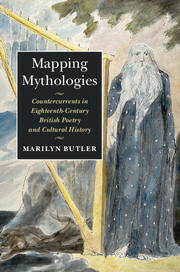 In this special interview, though, we discuss her recent work preparing for publication Mapping Mythologies, a book which was largely completed by the much-missed Marilyn Butler in the mid 1980s. Mapping Mythologies was published in August last year by Cambridge University Press. Celebrations of its publication and commemorations of the kindness, brilliance and generosity of its author were at the heart of ‘Marilyn Butler and the War of Ideas’, a commemorative conference held at Chawton House Library in December. 1) How did you first discover the manuscript that has now been published as Mapping Mythologies? Linda Bree from Cambridge University Press and I were helping David Butler sort Marilyn’s papers to go to the Bodleian Library. Amongst the masses of drafts for different projects – some hand-written, some in fading print on perforated-edged continuous computer paper – we found a ring binder containing the neatly typed manuscript of an apparently completed book. On top was a letter, written in 1985, by the late and still much missed Kim Scott Walwyn, then commissioning editor for literary studies at Oxford University Press. She and Marilyn had evidently been discussing the publication of a much larger work, with more extensive chapters on later romantic mythologizings. In this letter, Kim urged Marilyn to go ahead and publish this, the first part, as an independent volume. It would, she suggested, need very little work: it could be done in a couple of months. I took the typescript away, and read it with mounting interest, realizing as I did so that this was the hinterland to Marilyn’s work on Southey, Shelley, Byron, Keats, and early nineteenth-century orientalism. It dealt, however, with an earlier group of authors and a distinctively British ‘mythologising’, and raised questions of a rather different kind. It was succint, suggestive, and laid out a compelling argument. And it was written with the inimitable blend of witty sophistication and democratic clarity that characterized Marilyn in her prime. It seemed to me well worth publishing. 2) What were the major challenges that you faced in preparing the manuscript for the press? That initial manuscript was less finished than it looked. The notes and references were sketchy at best; there was some repetition, and in a few places there seemed to be lacunae. And there were, in fact, some later drafts of various parts of it. When it was decided that I should prepare the book for publication, I had taken with me not merely that manuscript, but several box files of Marilyn’s writings dealing with related subjects. These papers – now deposited with the rest in the Bodleian – show that Marilyn herself didn’t quite think that Mapping Mythologies was finished. She returned to it again and again in her heyday, sometimes to use material for a lecture or a conference paper, sometimes simply to re-work a point with which she was dissatisfied. As I worked my way through, when I came to a passage that seemed problematic I learned to trawl through the box files to see if there was a later rewriting that I might be able to use, weave in or substitute. I didn’t see it as part of my editorial brief to rewrite passages myself: I simply drew on Marilyn’s later text. Indeed, I more than once had the humbling experience of gradually coming to realize that a formulation of hers that I had thought clumsy, or not quite right, was actually saying something much more precise, and more subtly original than I had at first supposed. It was time-consuming but relatively easy to complete the notes, especially once I had made the decision not to try to update them with references to more recent work. In Marilyn’s own historicist spirit, I thought it important to present Mapping Mythologies as a book that had been conceived and in large part completed in 1984. This is also why, with some prodding from Jim Chandler, I wrote such a long Preface. I thought it was important to contextualize Mapping Mythologies as a strikingly original intervention in debates of the 1980s, such as those initiated by Benedict Anderson’s Imagined Communities, with its exploration of the cultural bases of nationalism, and by the ‘Cambridge school’ of intellectual history, with its then ground-breaking emphasis on historicist and contextualist interpretations of what had become fossilised as ‘the history of ideas’. There has been one major revision, that of the title. Marilyn’s working titles were A Map of Mythology or Poets and Myths. Linda Bree suggested Mapping Mythologies as both more dynamic and more pluralistic. The rather clunky subtitle was Marilyn’s own subtitle: I wanted to keep it to draw attention to what I saw as the book’s central, shaping, and quite original idea: the connection between the cultural projects of the poets it discusses and the beginnings of what we now call cultural history in the literary histories and popular antiquarianism of eighteenth-century England and Wales. Editing Mapping Mythologies was an enormous privilege, and I gained a great deal from it. It gave me a whole new perspective on eighteenth century poetry and cultural history. It made texts I had never thought much about spring to life: The Castle of Indolence, Chatterton’s African poems, Warton’s History of English Poetry, Joseph Ritson’s Robin Hood. Reading those scribbled over print-outs, I could sense, again and again, the excitement with which Marilyn felt her way towards a new idea, see how she was arguing with the books she was reading, and gradually refining and clarifying her thoughts. It was a revelation: a privileged glimpse of the inner life of a friend I thought I had known very well, and an exhilarating example of what it means to have an intellectual life. 3) How do you see Mapping Mythologies as expanding on Butler’s earlier book-length studies? It doesn’t so much expand on them as take a new direction. Marilyn’s critical biographies of Peacock and Maria Edgeworth had dealt with single authors. Jane Austen and the War of Ideas opened out to consider the differences between Austen and her contemporaries. Romantics, Rebels, and Reactionaries was briefer, but paradoxically covered more ground: it was an ‘overview’ of a whole period. It was, however, not a conventional ‘survey’of the period in question, but one that consciously revised accepted ways of seeing it. Mapping Mythologies is also a revisionary overview, but it is rather more polemically pitched. It is, indeed, in part, a response to some of the more negative reviews of Romantics, Rebels, and Reactionaries that were appearing whilst Marilyn was writing it. In particular, she is responding to those that accused her of privileging historical contexts over literary texts, of implying that (as one put it) ‘the work of art is caused by the age, and is not in any sense the cause of it’. In this, her next book, she delivers a witty but entirely serious riposte to such criticisms by turning to a series of writers – poets, literary historians, antiquarians – who saw themselves as makers of history, often in a peculiarly literal sense; for whom tradition was not something given but chosen, sometimes even made up. Mapping Mythologies is not merely a renewed argument for a historicist literary criticism, pitched against those giants of romantic studies in the 1980s, Frye, Abrams, Bloom, and Hartman. It offers a quietly original view of how imaginative works might indeed be instrumental in the shaping of history. It is a view that anticipates much more recent, more speculative, theories of aesthetic agency and of cultural politics. 4) To what extent do you see themes and strands from Mapping Mythologies being developed in Butler’s later essays? This book on the eighteenth century was always intended as the first part of a longer study of romantic mythologizing. Marilyn had begun to explore the significance of myth, or ‘paganism’, in the writings of romantic poets in Romantics, Rebels and Reactionaries. She was to explore it further in a number of published essays, which she conceived of as chapters in that unfinished second part (e.g. ‘Nymphs and Nympholepsy: the Visionary Woman and the Romantic Poet’ (1985), ‘The Orientalism of Byron’s Giaour’ (1988), ‘Romantic Manichaeism: Shelley’s “On the Devil” and Byron’s Mythological Dramas’ (1989),‘Shelley and the Empire in the East’ (1996)). Mapping Mythologies is, as I have suggested, the hinterland to this work. But it was a hinterland that sometimes came into view. During the decade after she finished Mapping Mythologies, Marilyn returned to some of the subjects she had first touched on there in conference papers and published essays. She reworked some of her thinking on images of the British nation in ‘Romanticism in England’, in Roy Porter and Mikulás Tiech’s volume, Romanticism in National Context (Cambridge, 1988); on ‘Antiquarianism (Popular)’, in Iain McCalman, ed., An Oxford Companion to the Romantic Age (1999); on ‘Blake in his time’ in Robin Hamlyn and Michael Phillips, eds., William Blake (Tate Gallery, 2000). She gave conference papers on ‘the Bristol school’ and on Iolo Morganwg. And she also pondered the larger theoretical questions that had emerged for her during the writing of Mapping Mythologies in several seminal essays published between 1985 and 1996 – especially, perhaps, ‘Against tradition: the case for a particularized historical method’, in Jerome McGann, ed., Historical Studies and Literary Interpretation (Madison: University of Wisconsin Press, 1986); and ‘Repossessing the past: the case for an open literary history’, in Marjorie Levinson, ed., Rethinking Historicism, (Oxford: Basil Blackwell, 1989). 5) In what ways do you hope that Romanticists will engage with and learn from Mapping Mythologies now that its insights are available to them? One answer to this question is that some of those insights have been available for a long time: partly through the published work outlined above, and partly through Marilyn’s vivid contributions in more informal contexts – supervising graduate students, participating in conferences. She always saw her own work pragmatically, as something that others could pick up and take forward. Academic work was for her not a solitary search for stardom, but an ongoing conversation; she loved being part of it, and she was genuinely excited by other people’s ideas. The ideas and material that she was unfailingly generous in sharing have been questioned, refined, and expanded on in much more detailed scholarship – such as Nigel Leask and Philip Connell’s Romanticism and Popular Culture in Britain and Ireland (Cambridge, 2009), and the series of brilliant publications on Iolo Morganwg and the Romantic Tradition in Wales produced by researchers at the Centre for Advanced Welsh and Celtic Studies, University of Aberystwyth. But there is much more in Mapping Mythologies that might be taken up, argued with, developed – its brief but suggestive new readings of Thomson and of Collins and (more provocatively) of Lyrical Ballads; its concern with provincial towns, bookshops, journals as centres of oppositional culture in eighteenth-century England; its insistence on importance of popular antiquarianism and its place not merely in the intellectual history of the eighteenth century but in a longer tradition of cultural politics (to name but a few).